As part of this month's 'Organic & Natural Beauty' theme on my blog, I'll be reviewing several products that fall into these categories. There are safer alternatives both for our bodies and for the environment that are available in many consumable products, including the beauty industry. What I would like to do is share some of these products throughout the month and educate myself about the benefits, the differences and the end result: Do they work as well as the products that do not consider themselves organic and natural? I've been learning quite a bit in searching for the answers to these questions, and I hope I can provide you with some useful information along the way. There are some differences between the terminology natural and organic. Here's a description that answers the question "What is the difference between natural and organic beauty products? -Natural refers to ingredients derived from plants, minerals, or algae. -Organic describes substances grown without synthetic pesticides or fertilizers, and processed without man-made chemicals. -Made with Organic Ingredients means that 70% or greater of the ingredients are organic content. -USDA Certified Organic is the highest standard. USDA Certified Organic means that 95-100% of ingredients must meet USDA organic standards for food. The products I'll be reviewing will generally fall into one of these categories, or a combination of these categories. Some (like many nail polishes) may not fit into these specific categories, but we'll also be exploring many of the 'safer' nail polishes, mainly the move to be more environmentally friendly by using less toxic ingredients. Now, let's start our first review. Methanol, methyldiglycol, trimethyl hydroxypentyl isobutyrate, equisetum arvense (horsetail) extract, tocopheryl acetate (vitamin E), aloe barbadensis leaf juice, denatonium benzoate (bittering agent). As I'm finding with all natural/organic products, the price is generally higher. However, I'm also finding that from an environmental/health perspective, sometimes a reasonable, yet higher price is worth the cost. 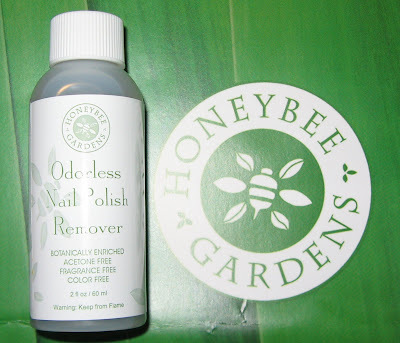 I'm not going to go out and replace everything I own with natural/organic properties, but I do think this is a product I'll keep in my arsenal for days when my hands need a little extra gentleness or days when I'm doing 5-6 polish changes one after the other, rather than expose them to such harsh chemicals repeatedly. This retails for $6.99 for a 4 oz. bottle. That is a nice alternative to the acetone! I have a non acetone remover I keep on hand as well, but it's not a natural one. I'll have to look into that! Does it smell nice? I only use acetone also. The non acetone just doesn't do anything for me. Nicole~it really feels good on my hands, rather soothing and cooling. Lucy~it has no smell at all, which is nice. It worked really well and I'm sure it's better for my skin.